Part Four of a series of posts on the Radical Librarians’ Collective event that took place on 10th May 2014 at the London Action Resource Centre in Whitechapel, London. This post is about the Libraries and Youth session pitched by Erin. 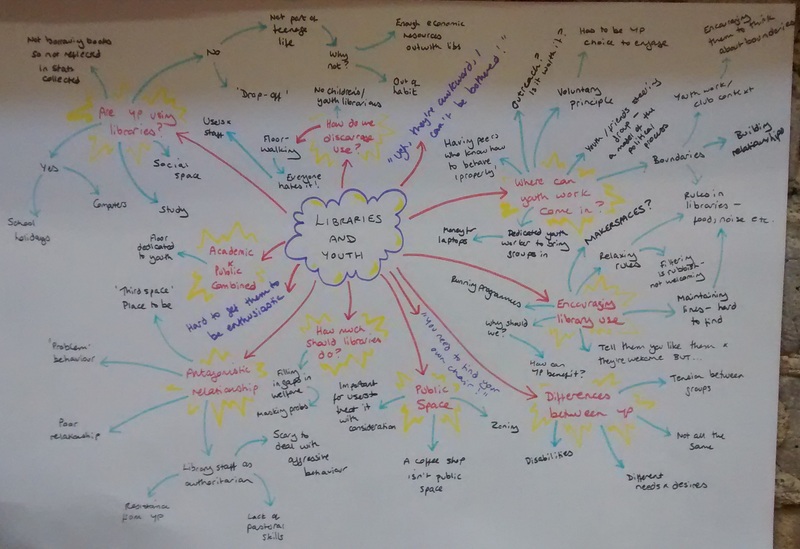 This is the mindmap for the session (click on the image for full size), which was really interesting and I found very useful for getting an insight into how youth work can contribute to an understanding of the role of libraries and library workers in relation to young people. How do we address the ‘drop-off’ that happens when children reach a certain age? Is it a habit we can get them to form? Do we need to address it, and should we? Do libraries have anything to offer that they don’t already get elsewhere? How do we reflect usage in statistics if they aren’t borrowing books? Why aren’t they using libraries? Young people don’t use libraries for a lot of reasons, and some of them relate to library practice. It’s important to acknowledge that young people aren’t a homogeneous group, but have different desires and needs, and there are intersectional issues such as disability which need to be considered. There are also tensions between groups in communities which can discourage library use. We talked about the ways use by young people is discouraged in our practice; there are often no dedicated children’s or young people’s librarians within library services. Another big problem identified was floor-walking – the staff hate it and the users hate it. There are particular issues relating to young people, such as potential embarrassment about being approached by a member of staff, especially if they’re looking for materials about something they might not want anyone to know about, such as sexual health information, resources about sexuality, or other information relating to sensitive areas of their everyday life. We also talked about dealing with the antagonistic relationship young people and libraries/library workers often have, including ‘problem behaviour’ and how to establish relationships with younger users so we can challenge it. We talked about how authoritarian librarians can and should be, how this can create resistance from young people, and how it’s difficult to work out relationships when staff don’t have experience of developing pastoral skills. There are some serious issues to consider, such as aggressive behaviour (and the possession of weapons) which can be very scary for staff to deal with. What is the role of libraries/librarians? Another topic we discussed was the tension between libraries as a public space (which are of value for young people to use because they are often the only place available where people aren’t expected to spend money) and the ways in which libraries may be expected to fill in gaps in welfare which may only serve to mask problems such as a lack of public resources. How can we encourage use? What’s youth work got to do with it? I found Erin’s insights from youth work really valuable, particularly ideas about the voluntary principle and how it has to be the young person’s choice to engage with an activity or a youth worker. A suggestion about how to encourage young people to use the libraries was for local authorities to hire a dedicated youth worker to bring groups into the library and work with the library to run events, programmes and generally help young people to get an idea about how libraries can be really useful for study and leisure. Another idea was to develop youth steering groups, which as well as helping libraries to develop their services to be geared towards young people in ways they’d actually want to engage with, also provides those involved with an example of the democratic process and experience of engaging with local civic activities. Being brought into libraries through a youth work context can also help young people to establish and think about appropriate boundaries in different contexts and build relationships. A very overdue update on what I’ve been up to! I’ve reached the one year mark in the PhD process and although there’s a very long way to go with a lot of hard work ahead, apparently I’m on track! My research topic’s altered slightly and become more specific, from the role of public libraries in supporting and encouraging democratic engagement, to the ways critical information literacy instruction can enable people to have political agency, which isn’t all that different in the ultimate goal of contributing to a stronger democracy, but is significantly different that I’ve got to connect the dots and make it clear that it does connect to the original proposal somehow. What’s next? My fieldwork starts in April, so I’ve got to get my methodology up to scratch before then, I’d like to make more progress on my literature review and I’ve got a couple of papers to write for the LILAC and Umbrella conferences, both of which I’m really looking forward to. The LILAC paper will focus mainly on my methods/methodology and what I’m aiming towards, and the Umbrella paper is a discussion of professional issues regarding the responsibilities of library and information workers to engage with substantive, political issues in information literacy education. I’ve applied to present at another couple of conferences and I’m going to try for an ESRC internship for the summer/autumn. Last week I attended the last of three workshops in the LIS DREaM series, in Edinburgh (I’ve also reported on workshops one and two). The sessions were all informative, and some were of particular interest as potential research methods for my PhD. I found the session on repertory grids particularly useful. The repertory grid (RG) is an interviewing technique that enables the researcher to elicit “both the conceptual content embodied in an individual’s mental model and the relationships which exist among these concepts” (Latta and Swigger, 1992). This is something I’m going to investigate further because a lot of the reading I’ve been doing around political behaviour and how people conceptualise politics highlight the issue that politics is a very personal topic. In addition, people’s attitudes and behaviours are not always rational or directly influenced by knowledge, and are often influenced by heuristics or rules of thumb. I want to talk to teenagers about their attitudes towards politics and participation, and what political issues they think are important to them, rather than assuming that I know what matters to young people. In order to do that properly, and talk about issues that are actually relevant, I need to be able to identify and define those topics. The use of repertory grids as a scoping tool prior to in-depth interviews seems like a good way of doing this. Dr. Turner pointed out that using a method like this with cards and scraps of paper is a very unthreatening way of getting a lot of information out of people, and I think this will be a benefit when talking about such a personal and potentially emotionally-charged issue. I can also use my findings to identify any possible trends and groupings of concepts when the data from the grids is turned into chart form. Dr. Turner recommended Repgrid for this, but there’s also an open source alternative. OpenRepGrid – this is an add-on to R, which is free statistical computing software. I’d never heard of R until a Researcher’s Digest session in my department a few weeks ago, and I’ve never used statistical software before, so at some point in the future I’m going to have to acquaint myself with it. I imagine bucket-loads of coffee will be required. Birdi, B. (2011). ‘Investigating fiction reader characteristics using personal construct theory’. Aslib Proceedings, 63 (2/3), pp.275-294. Crudge, S.E. & Johnson, F.C. (2004). ‘Using the information seeker to elicit construct models for search engine evaluation’. Journal of the American Society for Information Science and Technology, 55 (9), pp.794-806. Latta, G.F. & Swigger, K. (1992). ‘Validation of the Repertory Grid for Use in Modeling Knowledge’. Journal of the American Society for Information Science, 43 (2), p.115. Madigan, D. et al. (1995). ‘Repertory hypergrids for large-scale hypermedia linking’. International Journal of Human-Computer Studies, 43, pp.465-481. McKnight, C. (2000). ‘The personal construction of information space’. Journal of the American Society for Information Science, 51 (8), pp.730-733. Mengshoel, O.J. (1995). ‘A reformulation technique and tool for knowledge interchange during knowledge acquisition’. International Journal of Human-Computer Studies, 43, pp.177-212. Oppenheim, C., Stenson, J. & Wilson, R.M.S. (2003). ‘Studies on Information as an Asset II: Repertory Grid’. Journal of Information Science, 29 (5), pp.419-432. Potthoff, J.K. et al. (2000). ‘An Evaluation of Patron Perceptions of Library Space Using the Role Repertory Grid Procedure’. College and Research Libraries, 61 (3), pp.191-203. Rugg, G. & McGeorge, P. (2005). ‘The sorting techniques: a tutorial paper on card sorts, picture sorts and item sorts’. Expert Systems, 22 (3), pp.94-107. Whyte, G., Bytheway, A. & Edwards, C. (1997). ‘Understanding user perceptions of information systems success’. The Journal of Strategic Information Systems, 6 (1), pp.35-68. Much as the sessions were all interesting introductions to different research methods, I found that the conversations snuck in between talks were also of great value (and wish we’d had time for more). Along with the final session of the day – impact snakes and ladders – I found that some issues I have about the ‘state of the profession’ and current goings on are shared with others. For the final session we were split into groups and asked to answer some questions, then join with another group to share our responses, which roughly lined up with one another. My group, full-time PhD researchers, was paired with the group of public library workers. To what extent do you consider that it is a PhD student’s responsibility to ensure that their PhD study has impact? What strategies have members of your group developed to ensure that your PhD project is having/has impact? Are there any particular difficulties with ensuring that your project has impact when you are a PhD student? LIS researchers would like to complete projects to support librarians in delivering their services. a) What do researchers need to do to make this happen? b) Are there any particular difficulties for public librarians in accessing and using LIS research? How could these be addressed? We were asked to discuss issues of relationships between research and practice and come up with recommendations about how to improve communication and getting research into practice etc. The usual suggestions came up, including ‘continuous discourse’, ‘networking events’ and ‘communicating with each other’. This is all well and good, and I appreciate the value of events such as the LIS DREaM Project and the work that goes into them, but I think the issues we have go far deeper than putting researchers and a few interested practitioners in a room with each other. No amount of that will solve the underlying systemic issues that exist within higher levels of the profession, and stem from a lack of appreciation of the values and principles of public libraries and the point of academic research. This isn’t something new and is an ongoing problem. A number of our ‘solutions’, ironically, were things that used to exist. And quite frankly, it’s a crime that they don’t any more. Public Library Journal, for example, was the only UK journal that published the kind of research that’s actually useful and potentially implementable by practitioners. And without consultation or notice, CILIP killed it. We suggested publishing research that promoted improvement and innovation in library services, and demonstrated the value of libraries to society. If only there was some kind of government department that ‘got’ that kind of thing. It could maybe include related services…museums, and archives, perhaps. We could call it the Museums, Libraries and Archives Council. What’s that, we had one? Oh, the coalition government got rid of it? Bummer. A number of us also felt quite strongly that although high-quality research is being conducted in academic departments across the UK, its impact is severely limited if those in control within library services find it inconvenient to listen and respond to the results in a meaningful way. This is if researchers can even get access to library services to research within in the first place, which for various reasons can be incredibly difficult. Thanks to Hazel and everyone involved in the workshop for another useful and thought-provoking day. I’m going to be submitting a position paper to the AHRC Justice Symposium that’s being held at the University of Stirling on Saturday 28th April. I think it’s a really good opportunity for Computer and Information Science researchers to make contact and share ideas with researchers in other disciplines, as well as being good practice for presenting in an academic environment, so I thought I’d share the details in case there are other Strathclyde or Stirling students who’d like to get involved. Any Strathclyde/Stirling students wishing to participate in the event should email graeme.t.brown@strath.ac.uk by no later than Friday 30th March for a booking form, and ensure that they provide a brief outline of the intended topic and content of the position paper to be presented. Students and staff from Strathclyde will be able to take advantage of free transport from campus to the symposium and lunch and refreshments will be provided on the day, again free of charge. 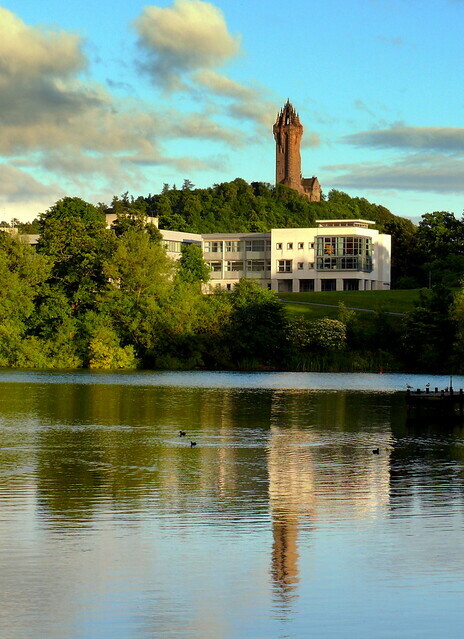 The purpose of the event is to bring together researchers and students from Strathclyde and Stirling in intellectual debate and discussion, and to mark the establishment of the Consortium agreement that now exists between our universities. As you may know, the Consortium has attracted significant financial support in the form of studentships from the Arts and Humanities Research Council (AHRC). There will be two main elements to the symposium. In the morning, staff and students will gather to hear a keynote address from Chris Mullin, the author, journalist and former MP who served as a minister in three departments of British government and was chairman of the Home Affairs select committee. Chris Mullin’s books include three highly acclaimed volumes of diaries, “A View from the Foothills”, “Decline and Fall”, and “A Walk-On Part”, along with the novel “A Very British Coup”, which was made into an award-winning television series. His “Error of Judgement – the truth about the Birmingham Bombings” led to the correction of one of the biggest miscarriages of justice in British legal history, and was made into a drama documentary by Granada Television. After lunch, delegates will be able to attend round-table discussions on the theme of Justice as it relates to their specific subject area, be that History, Literature, Creative Writing, Publishing Studies, Journalism, or Archives and Information Sciences. The CIS strand of the BGP Consortium Symposium invites staff and students from Strathclyde and Stirling universities, who are working in CIS related areas, to present position papers of no more than 10 minutes on a CIS specific topic that is closely related to the overarching symposium theme of justice. Due to time constraints the number of presentations will be limited to four. The structure of the CIS specific event is designed to break down into two broad sections. The first section will consist of the position paper presentations. This will be followed by a discussion session that relates the specific topics covered within each of the presentations to broader issues within the justice theme that are relevant to the CIS discipline. The justice theme of the BGP Consortium symposium is particularly relevant to the CIS discipline and can be approached from multiple perspectives. It is not the intention here to produce an exhaustive or exclusive list of topics that participants may discuss, but a range of potential topics are offered below that that may or may not be taken up by participants. The public financing of public libraries and information services; the nature and consequences of privatisation of public libraries and information services and the consequences of specific treaties such as GATS. The extent, nature and consequences of neoliberal and neoconservative policies on publicly funded information services. Information poverty and the digital divide(s). This could be related to other broad concepts such as equity of access and information literacy or more specific areas such as the way individuals access healthcare information or political knowledge to engage with democratic processes (or the role information providers play in providing this information). An examination of the way information was/is provided under totalitarian regimes: can social media undermine certain aspects of state sponsored censorship? What are the implications of search engines censoring results and in the case of Google, closing certain AdSense accounts? The extent and effects of self-censorship: what were the effects (actual or potential) of Section 28 of the Local Government Act 1998, which stated that local authorities “shall not intentionally promote homosexuality or publish material with the intention of promoting homosexuality”, on library collection policies. What are the effects of internet filtering software on the ability of public library users to search for information online? What impact is the ‘guerrilla librarian’ movement on social justice having and can the profession learn from it? What role did social media and citizen journalism play in the Arab Spring uprisings? Does unmediated content delivery on the internet constitute a fairer platform for discussion or are the traditional publishing avenues still necessary to ensure provenance and reliability? Does Freedom of Information legislation make public bodies more accountable and improve social justice? In what way has legislation such as the PATRIOT Act in the United States had an impact upon data mining and data protection?